Formosat-5 leaving Taiwan. Image courtesy of National Space Organization, Taiwan. Taiwan’s first indigenously-developed high-resolution remote sensing satellite, FORMOSAT-5, has arrived at Vandenberg Air Force Base, California. A team of Taiwanese engineers welcomed the satellite to prepare for its launch slated for 24 August 2017, on SpaceX’s Falcon 9 rocket. FORMOSAT-5 was commissioned by Taiwan’s space agency, the National Space Organization, and in contrast to its previous three satellites, is completely indigenous. Jointly developed by a total of 50 Taiwanese teams comprising small companies, universities, and government bodies, work on the satellite began six years ago in 2011. Weighing 475kg, FORMOSAT-5 will operate in a sun-synchronous orbit at a 720 km altitude, and will house an optical payload with a 4-metre resolution for colour images, and a 2-metre resolution for black-and-white images. It also contains an Advanced Ionospheric Probe, and other scientific instruments, as a secondary payloads. 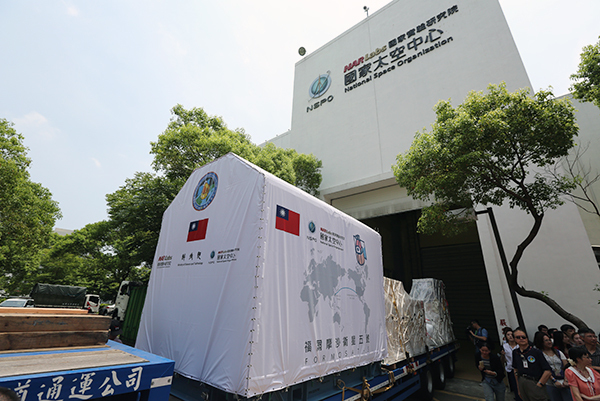 The satellite left Taiwan on 19 July 2017, flagged off with an official ceremony marking an historic moment in Taiwan’s space history. It was transported to Los Angeles via a China Airlines cargo aircraft, and arrived at Vandenberg on 26 July. Taiwan’s space programme was established in 1991, and has so far commissioned four Earth Observation satellites, and a series of picosatellites and smallsats. It also has an active sounding rocket programme, which develops indigenous multi-stage hybrid rockets.